Hello, i´m not an american trader but i feel curiosity. who writes the list of forex brokers off shore authorized to acept traders from USA? NFA, CFTC? Has anybody tried to demand these authorities at a court with a good lawyers team? What´re the real reasons behind this nonsense regulatory body? Is “get up, stand up fight for your rights” an option? [/quote]NO, get up, stand up fight for your rights is not an option, because it’s the law.of the land. Tried the account creation again, and "Account opening failed"
On what basis are we including AdamantFinance.com in our list? 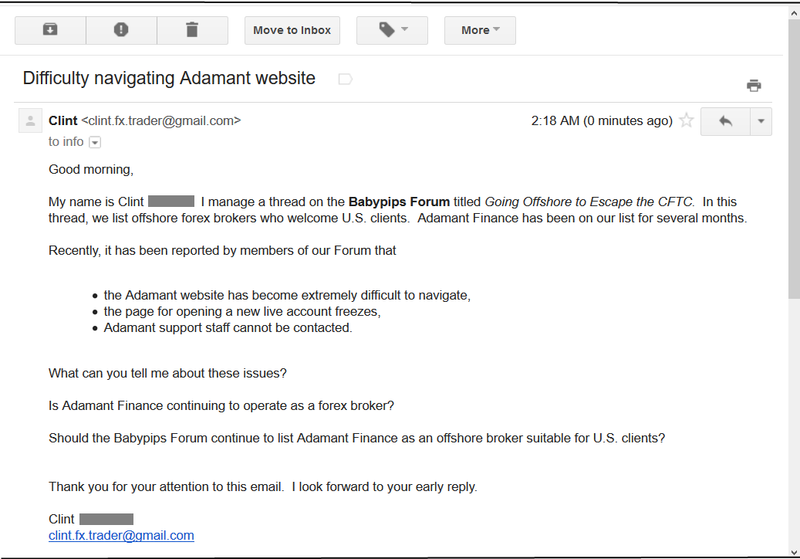 Do we have AdamantFinance trader clients anywhere on this thread? (1) a legitimate broker that (2) welcomes U.S. clients. If their legitimacy is in question, we will have to remove them from our List. 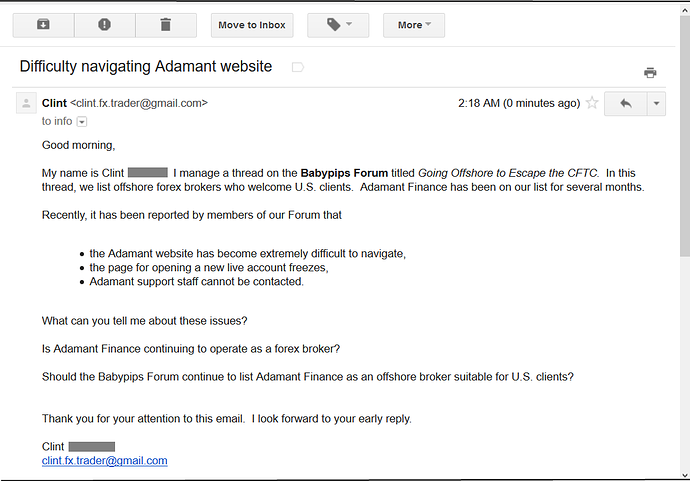 Until we find out what’s going on with this broker, I will add a WARNING to the Adamant Finance listing on post #1. I think they have proved to be stable and have stood with their commitments so far. I would vote them as a trusted broker. BTW, any bitcoin based brokers you found outside of what we already have ?, It will be great to be able to add some crypto brokers to our list. TRANSFER METHOD AT SHAPESHIFT. Here’s the problem. my money back on the failed transaction (minus the fee). CHOOSE THE “PRECISE” METHOD; CHOOSE “QUICK” INSTEAD. into BTC and on to the MT5 Evolve.Markets account in less than 3 minutes !!! Broker in the Crypto form that is accepted… very quickly !! just signed up to FinPro account – anyone notice TurnKey Fx Demo server registers as a “Real” account for EA’s and third party services? There has been no reply to my email to Adamant Finance. Their website remains essentially unusable. Their support staff remain unreachable. Later tonight or tomorrow, I will remove Adamant Finance (SVG) from our List. Any thoughts on the Dodd-Frank rollback, as far as US forex traders are concerned? The rollback you’re referring to was extremely modest, easing the regulatory burden on a certain group of small banks, and nothing more. It falls far short of Trump’s campaign promise to repeal Dodd-Frank. President Trump on Thursday signed bipartisan legislation rolling back some of the Dodd-Frank financial rules put in place after the 2008 financial crisis, touting another victory for his deregulatory agenda. But the bill fell well short of his campaign call to dismantle the 2010 Dodd-Frank law, leaving key pillars unchanged, including the Consumer Financial Protection Bureau. Instead, with the key support of some Senate Democrats, the legislation focuses relief on small and medium-sized banks that had complained they were unfairly burdened with regulations designed to prevent a future crisis. President Trump holds a White House ceremony to sign legislation rolling back some of the Dodd-Frank financial regulations put in place after the 2008 financial crisis. Only one Democrat attended. Previously in this thread, I have written that the CFTC’s strangle-hold on retail forex would exist with or without Dodd-Frank. The legislation that gives the CFTC control over retail forex pre-dates Dodd-Frank. So, even if Trump manages – sometime in the future – to scrap the whole damn thing, U.S. residents trading through U.S. brokers will still be stuck with restricted leverage, the FIFO rule, and the prohibition against hedging. The control-freaks at the CFTC are not being restrained – they are extending their control. That paragraph makes clear that the CFTC’s mandate was (originally) to regulate futures contracts on U.S. futures exchanges. Accordingly, the courts struck down the CFTC’s attempts to extend their authority to include retail forex – because a retail forex position does not satisfy the definition of a futures contract. After years of battle in the courts, the control-freaks won, and now retail forex is regulated by the CFTC, on the basis that rolling spot forex transactions look enough like futures contracts that we’ll just go ahead and pretend that they actually are futures contracts. Language – and even specific legal terminology – can be twisted into a pretzel by control-freaks. If you think the CFTC is limited to regulating futures – well, you don’t appreciate the territorial ambitions of the CFTC. They want to regulate cryptocurrencies. But, there’s just no way to twist the language- pretzel tight enough to make cryptocurrencies fit the definition of a futures contract. That’s no problem for the control-freaks. They simply claim that the Commodity Futures Trading Commission should have control over anything that can be classified as a commodity, whether it has anything to do with futures, or not. See what you can do with the language-pretzel? You can interpret commodity futures to mean commodities or futures. Then, all you have to do is get your buddies at the SEC to declare that cryptocurrencies are not currencies – instead, they are commodities – and presto! you’ve seized control of cryptocurrency regulation, just like you seized control of retail forex regulation. It’s good to work for the CFTC, or anywhere else in the Deep State, if you’re a control-freak. “we are partnered with more than 16+ Tier 1 Liquidity Providers. I’m holding out on finding who these liquidity providers are because I think transparency in this area is absolutely necessary since Turnkey is unregulated. How many Tier 1 relationships does the typical Prime of Prime have? (Usually 1 or maybe 2). How many of these PoPs are offshore? Got one of my withdrawals from CCM today - the request I initiated Feb 22, 2018. I put another request in April 3, and it’s yet to be processed. If I receive it soon then I’ll trust CCM a lot more. Was very close to yanking the plug on all funds and investors held with them. Why is it taking so long? A withdraw should be fully processed within 24 business hours. That must have been quite painful. Hopefully we won’t see you over at FPA Scam Alerts folder. yes i believe TurnkeyFX-Demo is responding with a parameter of “Real” instead of “Demo”. 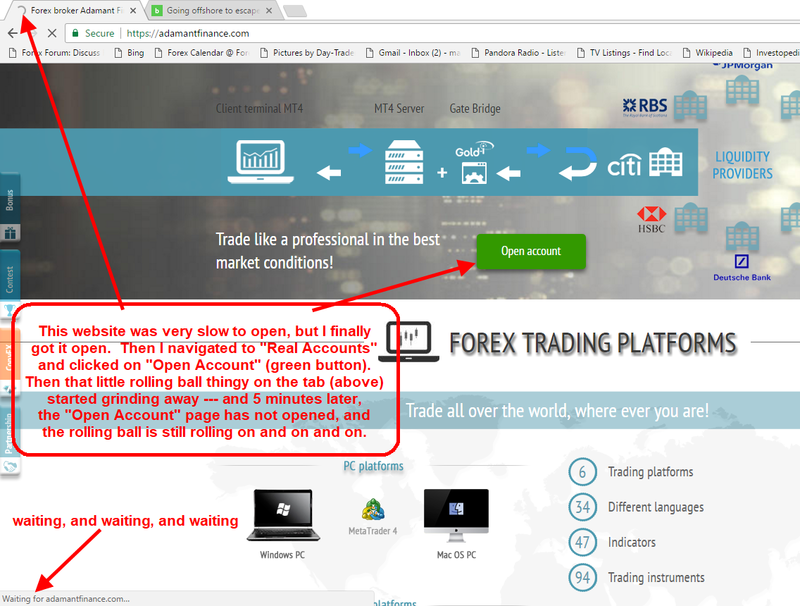 so EAs, Third Party services such as Myfxbook, believe TurnkeyFX-Demo is actually a real account versus a demo account. this is no big deal for Myfxbook, as you can change the dropdown (which initially defaults to what the server responds with – for TurnkeyFX-Demo it is Real) to whatever you like. but this is a potential issue for commercial EAs which rely on this parameter to determine if you are using a Real account or not. many commercial EAs limit the amount of real accounts you have on a per license basis. as an example, if you buy 1 license for an EA, there is a chance you can’t run a real account with a demo simultaneously on FinPro. this can be an issue if you like to test different settings on the demo, etc. one other topic i would like to add is security – FinProTrading does not have any two step authentication anywhere. this is very surprising for a broker in 2018 not to have any sort of authentication for logins, withdrawals, etc. i will say though that FinProTrading spreads are amazing, and i hope they add Two Step Authentication soon, as i would like to use them for many of my EAs which are spread dependent. all of which technicals, taken together, put most other brokerages in the shade.